First is that I fell in love. A strong love. An honest love. I could feel my priorities in life completely shift when love showed up like it did… unexpected but at the perfect time. The lakes allowed me to be closer to that love, and that love washed away any doubts that were lingering about moving away from what was familiar to me. Love is a powerful thing and it made me feel safe. The second is pretty simple… I grew up. I have developed amazing friendships that have an unspoken mutual understanding that being an adult is not for sissies and life sometimes can keep us apart for a significant amount of time, but we truly cherish every moment that we now have together. Yes, I miss them every day, but at this age I have been blessed with such a solid foundation of true friends… friends that are constant no matter what life deals out. Third, I enjoy the slower pace of life here, and every single time I say it I shake my head and smile, because I hear my 70 year old neighbor say the same exact thing. I love the little bar on the corner where “everyone knows your name,” knowing that I can look up at night and see so many stars that are not faded by the lights of a busy city, having friends visit so they can relax, living near a one stop light town that still celebrates its settlement days with a beer tent and live music, cooking dessert over a campfire, and losing track of time with friends out on the water. The last significant piece to all of this is my little brother. He continues to teach me things about life, even after he passed away a little over two years ago. This lake is his final resting place, and the feeling of being close to him makes me feel more at home than anything else. It has brought a new calmness to this beautiful body of water that I wake up to every morning. It is a calm that I did not feel before, but it is real and I know Eric would want that for me… he would want that for all of us. I have come to realize that it is the people, the love, your frame of mind, it is life, it is loss, and it is the experiences… however large or small that make a house your home, and each spot where we land is like a stepping stone through life. The stone I am on right now is a good one and the view is not too shabby. So, for right now I’m going to keep rolling my figure 8, and waving at people that I have yet to meet, and singing along with my music, and writing about my life… and always trying to find that “different kind of pretty” every single day. When I was a little girl, I had my life all planned out. I was going to be a monkey trainer, married, two kids, and riding horses in the mountains with the gobs and gobs of free time I would have because my personal cook would have dinner ready every evening, and my responsible children would finish their homework every day without being asked, and they would have a weird obsession of picking up after every mess they made. “Life goes on…..” You know, it was a phrase that I never really liked. Yes, it is the truth, but it seems so insincere, so blunt, and so lacking of any emotion or empathy. 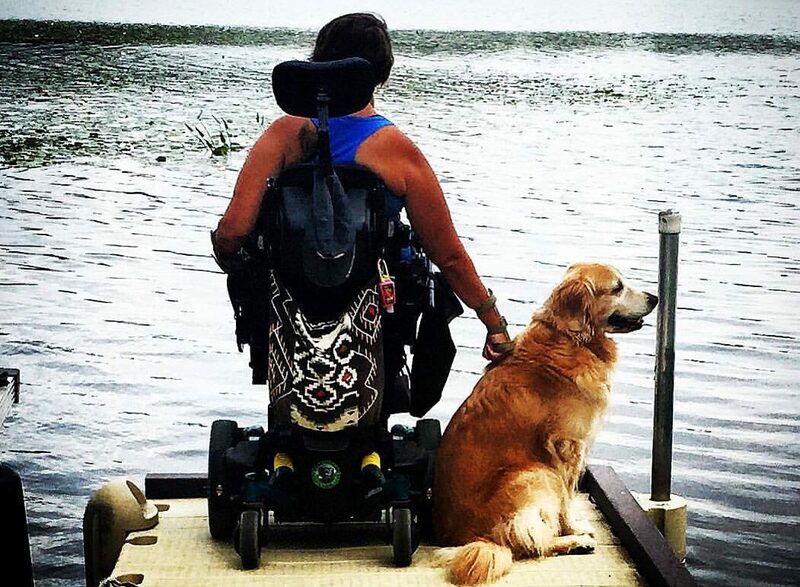 Now, at the ripe age of 35, I am sitting here in my wheelchair, at the end of the dock, writing down my thoughts, looking across a gorgeous lake, and watching “life go on.” I have come to accept that phrase. I am not heartbroken about those dreams I had as a little girl not working out. There have been many points throughout my life where I thought I had it all planned out, but the forces that be shook their heads and thought otherwise. Every single time my plans completely got thrown into the blender in regards to how I thought my life was supposed to be, there was always one thing that was guaranteed… Life goes on. Maybe you just need to coast on that detour, just for a little bit. I have learned to look at the detours of life from the perspective of relating them to real “detours.” Yes, some detours absolutely throw you for a loop, and get you so lost that you have to use every lifeline necessary to find your way. Sometimes though, there are detours that may in fact make it a longer ride to reach that final destination, but if you truly open your eyes, that ride is more beautiful, and it would have been something that you never would have experienced otherwise. It may be a blessing in disguise, it may scare the crap out of you, it may open doors to amazing opportunities, it may shut doors that you never thought would close, you may meet the love of your life, you may lose the love of your life, but it is life, and it is yours, and it is unpredictable. I by no means claim that I have it all figured out. So, until it is my turn to see the ones I have lost throughout this journey of life again, I will put my seatbelt on every morning and keep rolling with life as it “goes on,” doing my best to embrace the detours and wherever they lead me to, and holding on to the belief that hearts that are meant to be together will always find their way.